GASP! 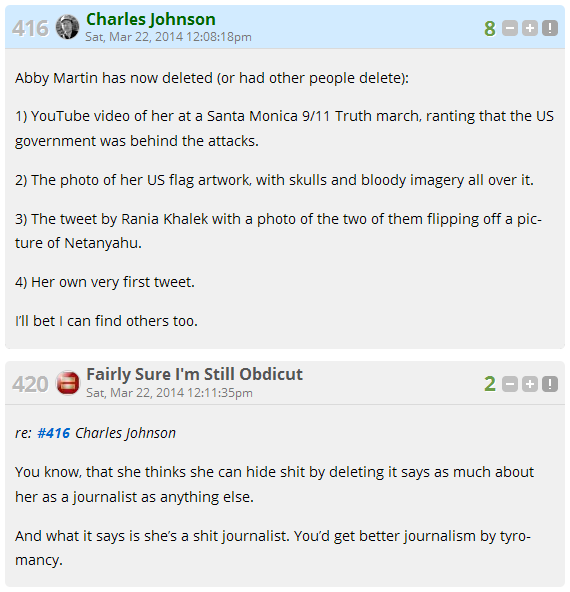 Abby Martin caught memory-holing tweets? Who would even THINK to do such a thing? 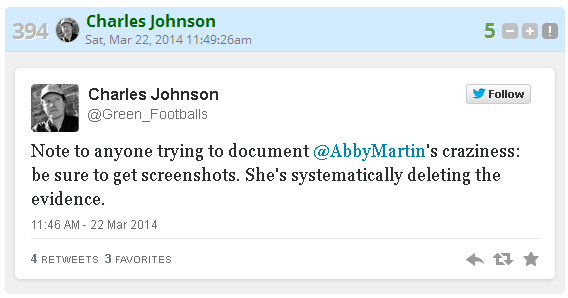 Charles Johnson would never stoop to that level of dishonesty, right Charles? Charles? ✔ Nearly 300 front page posts flushed down the Memory Hole… Check. ✔ Over 260 thousand comments tossed down the Memory Hole… Check. ✔ Over 6 million other comments blocked from public view… Check. ✔ Archive access to LGF through the Internet Wayback Machine blocked… Check. For a trip down Memory Hole Lane, here’s a link to DoD’s Archive of Charles’ Erasure Crumbs. What a #Rumpswab. UPDATE (Briareus): They completely miss the irony.